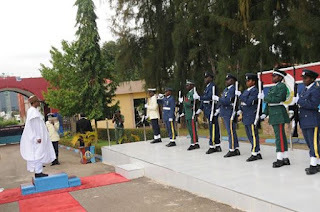 The highlight of the occasion was the conferment of fellow of the Defence College (fdc) on the participants, award of prizes to some graduands, who distinguished themselves during the course of their academic activities, presentation of Eminent Alumnus and Alumnus Star award. 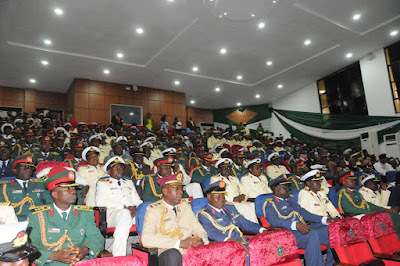 Colonel AI Taiwo of the Nigerian Army won the overall best participant and the President Award, Col M Ekwangen from Cameroon was the second best overall student winning the Vice President award and Col AS Chinade of Nigerian Army came third winning the Chief of Defence Staff awards. 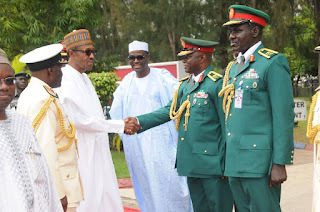 In his remark, the Special Guest of Honour and President, Commander-In-Chief of the Armed force, Federal Republic of Nigeria, Muhammadu Buhari, congratulated the participants and charged them to apply the knowledge they have acquired to advance national security and integration in their future endeavours.